Seattle architect Lawrence S. Hauser was born on February 12, 1907 in Omaha, Nebraska. He attended primary schools in San Francisco and Seattle before graduating from high school at St. Martin’s College in Lacey. 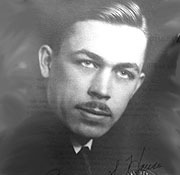 Hauser received his formal architectural education at the University of Washington, graduating in 1931. During his school years, Hauser gained valuable on-the-job training by working at an architectural office and reportedly participated in some hands-on construction and carpentry work. Well trained, he actually received his architectural license (No. L124) before graduating on December 17, 1930. Shortly after graduation, in October of 1931, Hauser formed a short-lived partnership with Luis Poyo in Seattle. The two architects opened an office in the Lyon Building and Architect & Engineer magazine announced that the firm would pay special attention to designs in the Spanish mode. Their only known design is Jerread’s Mortuary in Everett (1932); and a coffee shop in Seattle. Upon entering the profession, Hauser was actively engaged in the Washington State Society of Architects (forerunner of the AIA). He served as their secretary (1932) and was named one of their delegates to the Northwest Building Industry Conference (1931). A talented designer, Hauser was chosen along with four other architects to display their designs at the Frederick & Nelson Department Store in downtown Seattle in 1932. The display consisted of preliminary sketches of small residences, with some working drawings and models. As jobs became harder and harder to find during the Depression years, Hauser struggled and became a surveyor in 1936. He then took a job as a draftsman for the Austin Company (1937). The next year he was working as a salesman, but according to Polk Directories returned to some type of architectural job the following year. During the war years, Hauser served as an engineer with the U.S. Coast Guard (1941-44) in Seattle. It is unclear if he continued his architectural career after the war and disappears from city directories by 1946. There is some indication that he moved to La Mesa, California and may have practiced architecture there, but this has not been confirmed. Hauser passed away in Florence, Oregon on March 21, 1996.